Week 2 off to a Somewhat Rainy, but Awesome Kick Off! Wow! What a great first day everyone had…it rained at just the right moments…when all the students were where they needed to be! We are very excited to welcome 122 campers for week 2 this year! Although they were a bit quiet and timid this morning, we got them engaged right away and they are already coming out of their shells! Thanks so much for everyone’s assistance and patience this morning as we got all campers checked in! We have a goal to post a blog post each night this week with some highlights from the day and some conversation starters. [Admittedly, our family obligations have been great this summer, so I fell off the bandwagon last week 🙂 ] The conversation starters are meant to help you get over the “What did you learn today?” “Nothin’” or <shrugging the shoulders> we often see with our school-age students. We’ll also post a link to the photos we are taking throughout the week. If at any time you want a photo removed that is of your child, please let us know and we’ll be happy to take it down. They spent half their day with Dr. Bruce Walcott, exploring the engineering complex, touring labs, learning how to build motors, and investigating surface area and mass. The students were amazed at all the different labs, but by far their favorite was the anechoic chamber! Many of the students also did not realize all the different types of engineers you can be…so many fields and so many opportunities! They spent half their day with Dr. Lisa Amick, building 3d models with 3d pens and paper folding! The students really enjoyed the challenge of the origami. It was fun to learn about how to fold the paper in different ways and to put the nets together to form the 3d shapes. 3d pens are always a big hit every year. Not only do they help students build their own models, they also tap into their creative side. They take a lot of pride and ownership in their creations! We love seeing the uniqueness of the students come out! Day 1 is building day. All the students are doing EV3 robots this year. Today they focused on building their robots and learning about how the different parts and pieces work together. Tomorrow they will dive into the programming and start some of our challenges. 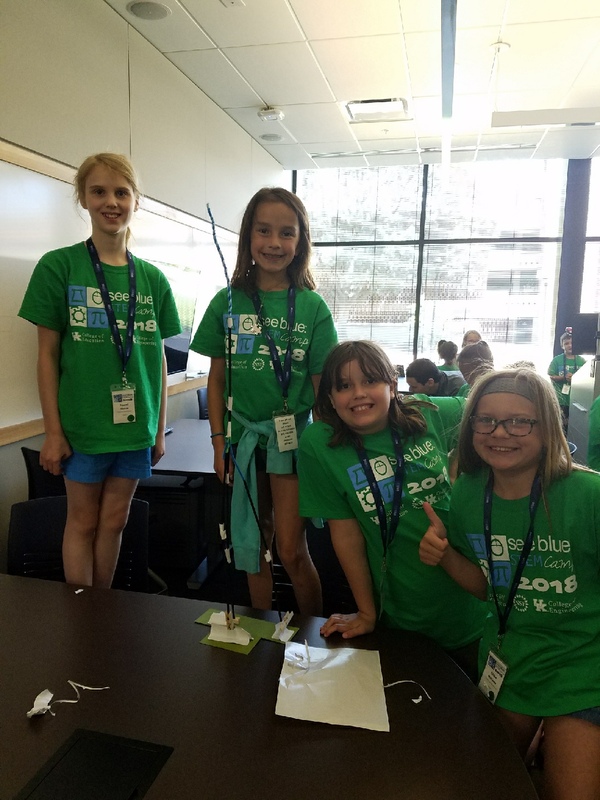 For the challenges, we use a blend of our own curriculum our robotics instructors have created and some of the FLL challenges, including the new one for this year. I learned that shapes can absorb sound. How engieneers think to solve problems. Small shapes can make up very large shapes and I found that very fascinating. I liked that we got to work in groups and how we learned in fun but productive ways. geometry is all around us and I want to learn more about my surroundings. Tell me about how you assembled your robot. What is your robot’s name?What do you think you will get your robot to do when you start programming it? Bridges to build and DNA to observe! 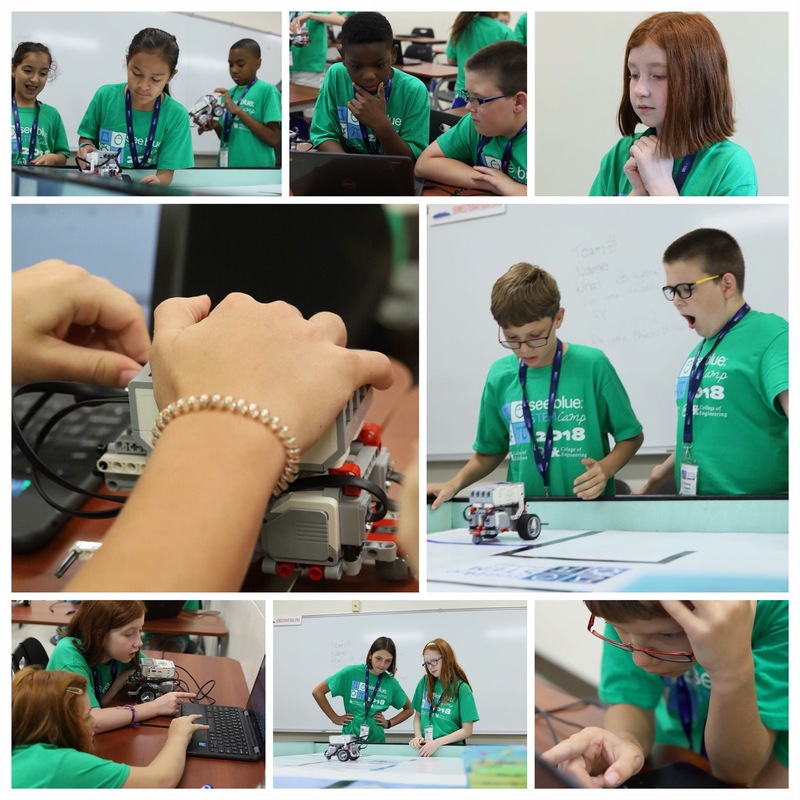 It was another exciting day in the life of a STEM and robotics camper! The sea of green and blue shirts were an awesome sight and generated some great buzz amongst the faculty and staff on campus! The students are doing a great job using their manners and were great listeners today. The groups finished building the Clawbots today and dove into learning to code on RobotC. Some have had a little bit of experience on RobotC, but most have not. RobotC is different than most of the students’ prior computer programming experience, so it takes a little bit to get the hang of it. They will dive deeper into the coding tomorrow and dig into some great challenges! Overall, they have really enjoyed getting to learn about a different robot and one that requires more building and understanding of moving parts than compared to the EV3 or NXT robots. They spent half of their day with Dr. Testa extracting DNA from a strawberry! They were very careful scientists with their tools and were amazed at what the DNA looked like! They also explored different types of DNA and how scientists use DNA to look at what living things are made of. It was bridge building day with Dr. Thomas! For a creative warm up, the students had to build the tallest free-standing structure they could, with very limited supplies. Then they moved on to bridge building, where they talked about supply and demand and material costs. After weighing through all their options, they had to build the sturdiest bridge with the cheapest cost. We had some amazing, creative, and sturdy bridges today! All the technology was working today, so the camp staff were extra-thrilled! They got into some cool building challenges and really are getting the hang of programming their robot to do different things. There was lots of dancing, high-fives, and positive words and excitement throughout the day as their confidence increased with programming. I learned that you can get DNA out of things. That everything that is on the world is made of the things on the periodic table. The middle [of a bridge] is not the strongest part. I learned to proberly (properly) + creadivly (creatively) bild (build) a bridge. if the bridg(e) falls you can all ways fix it. that evrybody (everybody) has divrint (different) DNa’s. that you can all ways fix it. How to desighsin (design) different things. Yes [I would like to learn more], because I want to see other fruit and people’s DNA. What do bridges need to be strong? How did you decide what materials to use for your bridge? How did you decide on your design for your bridge? How did your bridge do when you tested it? How tall was your tower you built? How did you extract DNA from the strawberry? How different was it to build the Clawbot compared to the EV3 (or other robot they’ve built)? What kind of tools did you have to use? How are you feeling about programming in RobotC? What makes it different from other computer programming you’ve done? Day 1 of Week 1 is in the books! Wow! What a great first day everyone had! We are very excited to welcome 90 elementary campers and 62 Vex robotics campers this year! They’re quite the eager group and we’re thrilled to have them on UK’s campus! Thanks so much for everyone’s assistance and patience this morning as we got all 152 campers check in. It went as smooth as it could have and awesome! We will post a blog post each night this week with some highlights from the day and some conversation starters. The conversation starters are meant to help you get over the “What did you learn today?” “Nothin’” or <shrugging the shoulders> we often see with our school-age students. We’ll also post a link to the photos we are taking throughout the week. If at any time you want a photo removed that is of your child, please let us know and we’ll be happy to take it down. Today was all about building and becoming familiar with the Vex system. The groups worked on building their chassis for the clawbot. Some groups also started trying some basic programming to get their clawbot to move. All the groups will be into the programming tomorrow, so expect more stories about how they’re getting their robots to move! It was a robot day today for these groups! 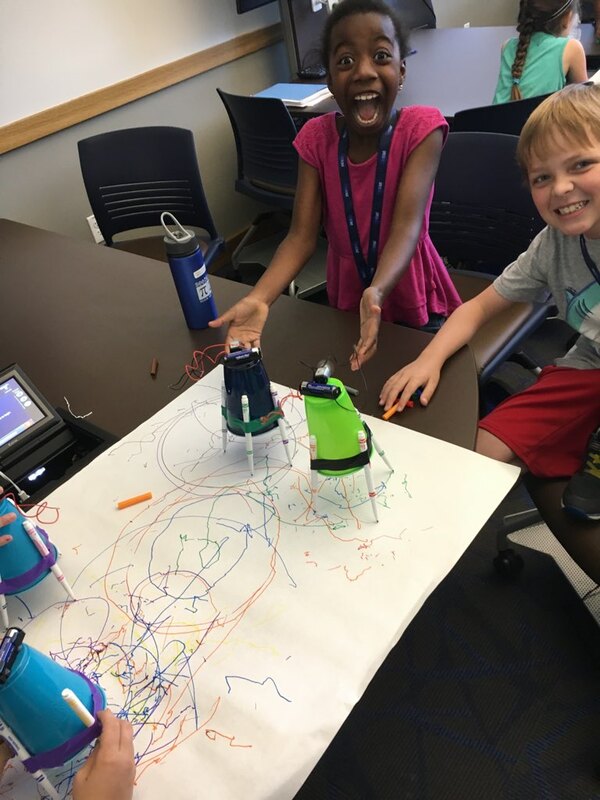 They spent half of their day with Dr. Walcott and Dr. Thomas building scribble bots from scratch. They learned about how motors worked, how electricity flows though the battery, and the importance of a cam on a motor. 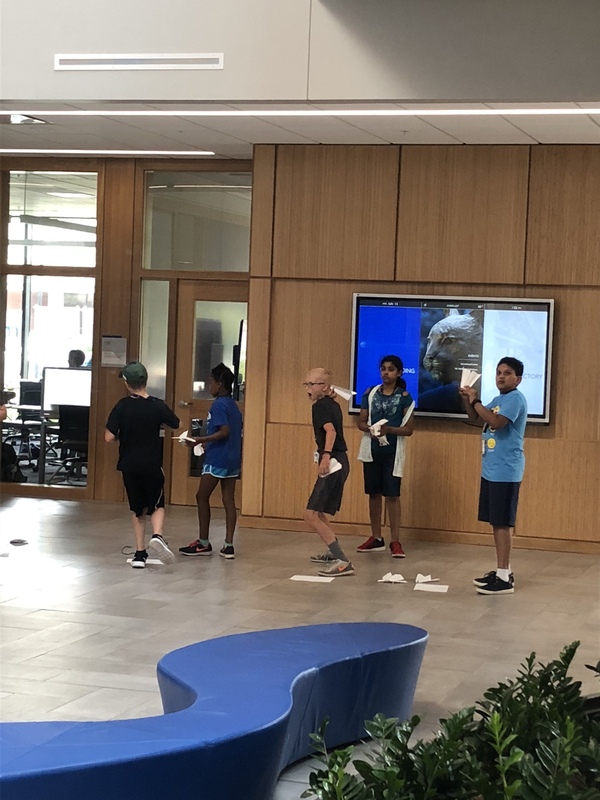 They had a lot of fun trying the bots out and even personalizing them a bit 🙂 The blue groups got put in their bags, so some didn’t make it home quite in one piece, but the students know how they are to be put together, so you can help with them that endeavor. They spent half of their day with Dr. Testa extracting DNA from a strawberry! They were very careful scientists with their tools and were amazed at what the DNA looked like! They also explored different types of DNA. The yellow group made DNA from strawberries today with Dr. Testa! In robotics, they are using the We Do 2.0 robots from Lego Education. UK switched over to a new wireless network last month and some of the Chromebooks had some issues, but we are happy to report that they’re all resolved and we’ll be back on track with devices tomorrow! The students were awesome with sharing devices and still getting their building in. 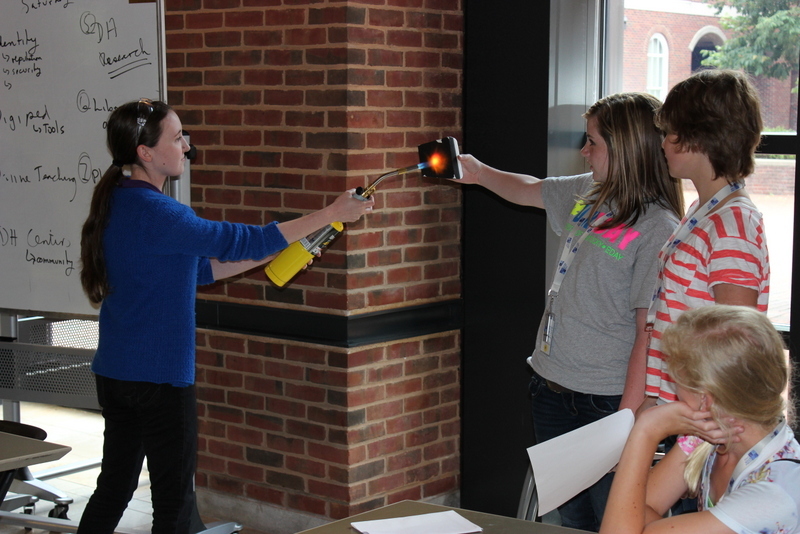 Many of the students were able to program their robots and try out some of the basic different programs. Lots more fun challenges coming tomorrow! Tell me about how you assembled your scribble bot. What tools did you have to use carefully? How did you know how to connect things? What did your scribble bot do when you connected the motor to the battery? Tell me about how you assembled your We Do robot? What is your robot’s name? What did you get your robot to do today? What is DNA? What things have DNA? How did you extract DNA from the strawberry? What did it look like? What is a chassis? How did you get it built? If they programmed today, what did they get their Clawbot to do?